*Hi friends, just a heads up that this post contains affiliate links. Affiliate links are indicated with an asterisk. 2016 EDIT: My major sources of American-made/ethical/eco-friendly fashion are now: eBay* and thredUp ($20 off your first order if you sign up here*)! Not everything you’ll find was originally made in America, but by buying secondhand (often in like-new condition), you won’t be contributing to the waste stream AND you’ll be saving money! There are tons of great stores and websites out there with Made in America items, but here are my tried-and-true (and Meredith Tested, duh) stores where I buy most of my Made in the USA clothing. If you’ve been to this blog before or you follow me on Twitter, this probably comes as no surprise. You might have to dig a bit but these stores carry lots of Made in America brands – just make sure you read the labels carefully. Some brands make certain items in the US and not others. Search “Made in USA” on Nordstrom.com and you’ll see what I mean. Cute dresses, accessories, home decor, oh my! I love the website and their stores, especially their discount/overstocks shop, Nordstrom Rack. Plus, Nordstrom’s customer service is the stuff of legends. I have never had a bad experience with them, ever. Top of my list if I need a cute dress for a wedding or something fun to spruce up my work wardrobe. My favorite feature is the photos of real customers in the items. Their customers detailed reviews have helped me make a purchase decision on more than one occasion. Also a great place to find unique gifts for female friends and relatives. If I’m looking for a specific item (like yoga pants for my sister in law…true story), I check out what brands my favorite #MadeinAmerica blogs and websites recommend, and then do a quick web search to see the price point, selection and what (brick-and-mortar and) online stores sell the item. The resources I typically check are: Made in USA Challenge, USA Love List, Modestics and Haute Americana. And yes I typically end up purchasing from Amazon.com because of their incredible selection. I find it difficult to browse on the site but when I have a specific product and brand in mind, off to Amazon I go! There are lots of amazing shops and online stores out there dedicated to bringing American-made fashion to your closet, but these sources above are (honestly) my go-to spots. A word of caution: I have to pretty much constantly remind myself that just because a product is Made in the USA (or made ethically by a cool brand), doesn’t mean A) the product/item is high-quality and B) I need the product/item in my life. Sometimes a beautiful dress is just something nice to look at. Not something I actually need in my closet. That’s where Pinterest comes in. I try to “trick” my fashion-loving brain by pinning the beautiful item onto one of my boards instead of hanging it in my closet. Sure, I can’t wear it but I can always go back to my board and admire it later. 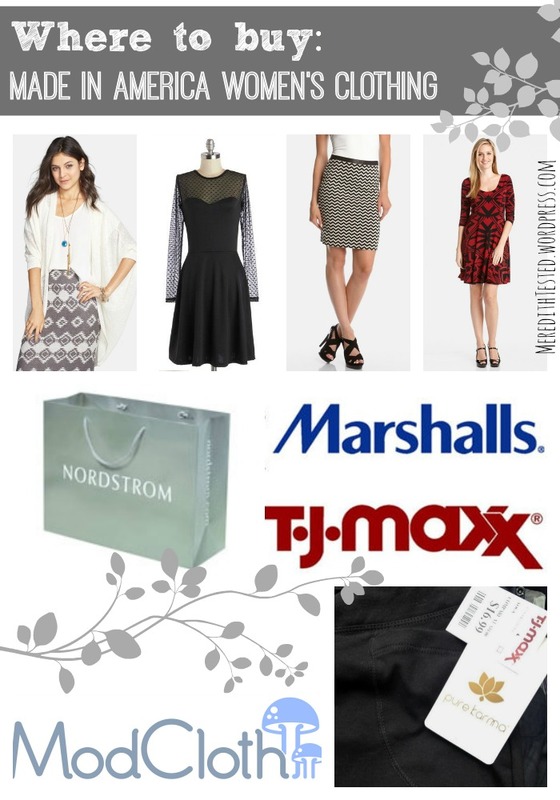 TJ Maxx and Marshall’s are my favorite! Thanks for the comment, Kelly! I’m not afraid to admit how much of my wardrobe I owe to those stores, hehe. I love your thoughts on pinning the item to Pintrest! Thanks, Isela! That “trick” definitely works for me. Pinterest is such a lovely concept – all the pins you want without the physical clutter (and paper scraps) in your home!